Nowadays, underground bands typically do something fancy to get noticed — creating baroque arrangements and baffling song structures or using whacked-out instrumentation to impress. 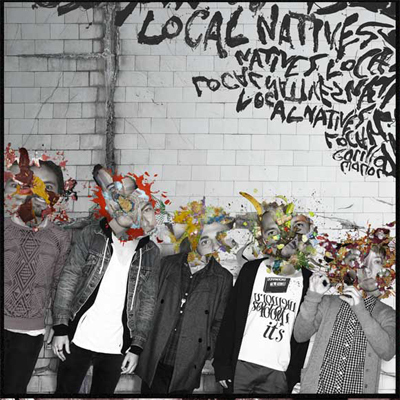 So it’s particularly refreshing when a band like Local Natives comes along and does something brilliant without really doing anything radically different. Gorilla Manor, their debut album (which finally hits U.S. stores this week, after building a buzz in import exile) simply has the catchiest songs you’ve heard in a long time, underpinned by fantastic, creative drumming and three-part vocals veteran bands would kill for. At first blush, it sounds like My Morning Jacket performing songs by The Shins, with soaring crescendos that provide gravity to would-be pop songs. While it’s a reference point for their sound, this critic’s “short cut” fails to peg the immediacy this Silver Lake, California quintet creates, like an old musical friend you’ve heard before but aren’t sure where. The early standout “Sun Hands” trickily vacillates between subdued and exuberant, both delicate and raucous, while “Airplanes” trots along nostalgically, nicely measured out. It’s a safe bet that the first part of their name will become a misnomer, as the world beyond California, and even the US, takes notice of this gem in the months to come. Check out the “Airplanes” video after the jump.